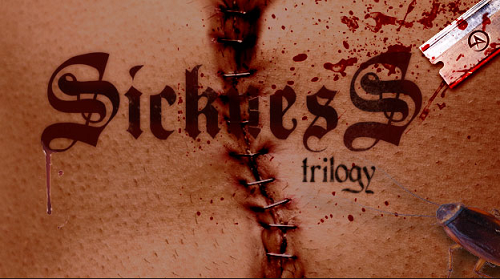 The Sickness Trilogy is a compilation of three of the most gruesome, most disturbing and most talked about geek/shock magic effects available. This is the video download version. Sean Fields is a master of illusions within this realm and seems to be untouchable! His magic tricks and graphic illusions have been used by magicians worldwide and have had countless TV appearances. Sean himself has spent his performing career showing these amazingly realistic effects to lay people all over the world. This is Sean's classic effect with an updated handling, Saw has been used all over the world by many top Pros and performed on TV by famous names like Criss Angel and Dynamo. you show a ring and clearly place it in your mouth, with a gulp you swallow the ring and show your mouth now empty. That wasn't even the gruesome part! Next you take a shoelace or a necklace and hold it up against your neck, slowly and painfully you begin a sawing action with the lace into your neck. After some struggle you lift your head to show the lace has now passed into your neck, you can clearly see the lace emerging from the sides of your neck! You begin to slowly pull on the lace and it slowly and visually begins to pass back through your neck. With one last final tug the thread breaks free from your neck and the ring that was just swallowed is now attached to the middle of the lace. A few years ago Criss Angel put out a video of him swallowing a signed coin and then retrieving it by slicing open his wrist and pulling the coin out from under his skin. This is Sean's homage to this effect, made ultra practical and ultra gruesome. A coin is signed and placed into your mouth, you then swallow the signed coin and show your mouth empty. A razor blade is displayed and then you do the unthinkable, you begin to slice your wrist with the blade. You heard that correctly, you slice open your wrist with a razor blade. As the wound opens up it is clear that amongst the blood that has begun emanating from the wound a coin can also be seen, you pull the coin from your wrist to show it is the exact same signed coin that you swallowed. This is a brand new piece of horror that only Sean could have thought of! Imagine the classic needle on thread illusion but with a twist. You display a needle just like any other needle and start to press it against your skin, this in itself will make some queazy! You then decide to push the needle into your neck, slowly and deliberately you begin to insert the needle into your neck at fingertips until it is fully inside your neck! You then display some standard cotton thread and rip a length of it from a cotton thread reel. One end of the thread is placed inside your mouth and you begin to swallow it. Once the thread is swallowed halfway you touch your neck and begin to prod around, you grip something with your fingertips, it is the end of the thread you have swallowed! As you slowly pull the thread from your neck the thread hanging from your mouth travels up into your throat. The thread being pulled from your neck is given a light tug and a needle pops out of your neck into view KNOTTED on the the thread. The rest of the thread is pulled through your neck and can be given to the spectator (if they want to even touch it!) for examination. Each of these effects are taught in detail making sure you learn every nuance and every subtlety to make sure that when you perform these illusions you can make them as realistic and gruesome as possible! This product is only for sale for adults aged 18 yrs and over. For professional use only.